MMBX Letter A B C D E F G H I Letter K L M N O P Q R S Letter mm Letter mm 1 Slotted and flared to meet electrical and mechanical requirements 2 Dimension to meet electrical and mechanical requirements Go online for data sheets & assembly instructions. Radlall J Visit www.radiall.com and enter the part number. Test / Characteristics Values / Remarks ELECTRICAL CHARACTERISTICS MECHANICAL CHARACTERISTICS AH dimensions are given in mm. Standard packaging = 100 pieces. Go online for data sheets & assembly instructions. Radlall j Visit www.radiaii.com and enter the part number. Plugs and PCB Receptacles STRAIGHT PLUGS (male center contact) MMBX Cable group Cable group dia. Part number Fig. A Captive center contact Note RIGHT ANGLE PLUGS (male center contact) Cable group Cable group dia. Part number Fig. A Captive center contact Note STRAIGHT PCB RECEPTACLES WITH PRE-ASSEMBLED ADAPTER (male center contact) Part number Fig. Captive center contact PCB Assembly instructions Packaging Note Go online for data sheets & assembly instructions. Radlall Visit www.radiall.com and enter the part number. SIMPLIFICATION IS OUR INNOVATION PCB Receptacles EDGE CARD PCB RECEPTACLES (female center contact) SCREW-ON RECEPTACLE (female center contact) Part number Captive center contact Panel drilling Go online for data sheets & assembly instructions. Radlall J Visit www.radiall.com and enter the part number. 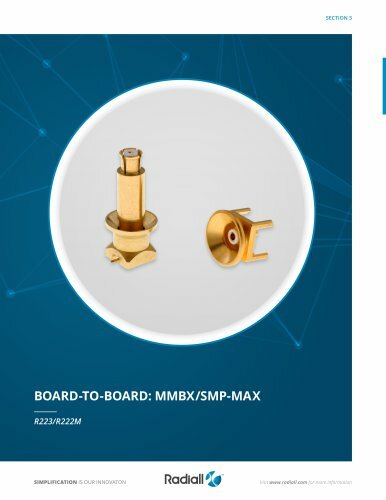 IN SERIES ADAPTERS (male-male center contact) MMBX Part number Fig. Length A (mm) Type Nominal Board-to-Board distance Other lengths available, please contact us. BETWEEN-SERIES ADAPTERS 15.7 Other configurations available, with flange, straigt and right angle. Please contact us. Go online for data sheets & assembly instructions. Radiall J Visit www.radiall.com and enter the part number. Demo Board Part number Panel Drilling P01 ■O' , 0 | O -B A DT A^)- ' -&■ * 5 holes COPLANAR LINE • Pattern and signal are on the same side. • The material of PCB is epoxy resin (FR4) (Er = 4.6). • The solder resist should be printed except for the land pattern on the PCB. Not valid for R223 424 870, please consult data sheet. Go online for data sheets & assembly instructions. Radlall J Visit www.radiall.com and enter the part number. Values / Remarks Test / Characteristics ELECTRICAL CHARACTERISTICS Packaging = 100 pieces box / 500 pieces reel. AH dimensions are given in mm. Go online for data sheets & assembly instructions. Radlall J Visit www.radiaii.com and enter the part number. SMP-MAX Jacks, Plugs and Cabling BULKHEAD STRAIGHT SLIDE-ON MALE JACKS FOR CABLES Cable group Cable group dia. STRAIGHT FEMALE PLUG FOR FLEXIBLE CABLE Cable group RIGHT ANGLE FEMALE PLUG FOR FLEXIBLE CABLE Cable group BULKHEAD MALE JACK SNAP TYPE Go online for data sheets & assembly instructions. Radlall'X# Visit www.radiall.com and enter the part number.